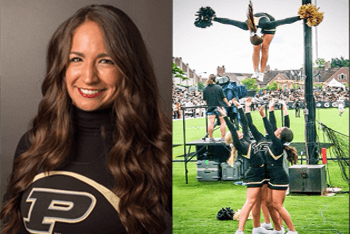 Sitting on the sidelines was not how Purdue cheerleader, Jacqueline, envisioned starting her sophomore year, but unfortunately a concussion occurred while “catching” another teammate. Jacqueline knew something was wrong the moment of impact, “I could actually feel my brain jiggle in my head when it happened.” For two months following the injury, Jacqueline was plagued with headaches, sensitivity to light and sound, fatigue, brain fog, and memory loss. During a visit home she consulted with Dr. Guyer who suggested she try Hyperbaric Oxygen Therapy, HBOT. Concussions are known to cause inflammation in the affected area of the brain. This may lead to a decreased blood supply and therefore a depleted oxygen concentration as well. Patients undergoing HBOT are in a 100% oxygenated environment as opposed to 21% in the normal air. HBOT can function to increase the concentration of oxygen in the blood which is believed to expedite healing time. Jacqueline enjoyed her HBOT treatments, even referring to them as naptime. “You see the chamber fill up with air and feel some pressure like taking off or landing in an airplane. You lay on the plush pad and relax, I would read a book, play on my phone, or sleep.” Jacqueline noticed a reduction in her symptoms with just three treatments. Over the course of a month, Jacqueline received ten HBOT treatments and then was released to resume all activities by a neurologist. Today, Jacqueline is a senior cheerleader at Purdue University who plans to pursue a career in Interior Design following graduation in the spring.